Product prices and availability are accurate as of 2019-04-19 05:18:56 UTC and are subject to change. Any price and availability information displayed on http://www.amazon.com/ at the time of purchase will apply to the purchase of this product. THIS IS AN ORDER FOR A SAMPLE OF THIS PRODUCT. If you purchase with Bestlaminate, we will credit you the cost of this sample towards your flooring. Free shipping applies to ONLY THIS SAMPLE, other orders from Bestlaminate are subject to shipping charges. 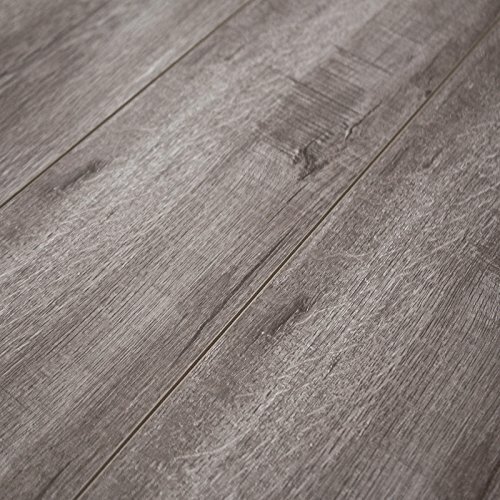 Tuscany Home’s Heather Grey laminate floor has varied shades of light and medium greys, these soft grey tones are brought together with a hint of taupe which enhances the authentically detailed wood grain texture. You can’t help but fall in love with its wide plank hardwood appeal. This floor is perfect for a living room, family room or den.